Sometimes when I talk with educators about digital transformation, I get the slow nod. You know what I mean: that nod that says "Yep, I agree with you but hey! not gonna happen because, well, you know, we've got a fire hose of other stuff coming from the district and the state." Though sometimes it means, "I'm nodding because I know I'm supposed to know what that is, but I have absolutely no clue and I don't want my colleagues to know I'm clueless." Either way I can get a little frustrated because I know educators are going to return to their buildings and that will be that. So I could share videos helping them understand WHY digital transformation matters, and that's great for those educators in the room but if their administrators and the district officials and their colleagues don't have the same information, they'll get the slow nod when they try to express the value and importance, no, the imperative of digital transformation. Herewith, then, a nominal attempt to spread the word a bit further and a bit wider. 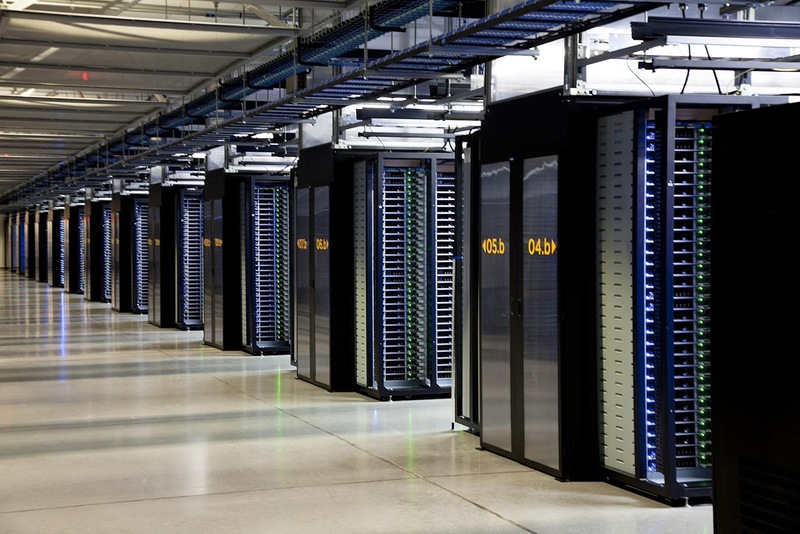 Corporations are anxious about digital transformation in their businesses. Why? “Digital not only accelerates the pace of change but also brings new opportunities for firms that can embrace the technology fast enough” (p. 3, The Digital Business Imperative; Feb 15, 2017). Businesses know that purchasing is different, expectations are different, products and employees are different. “There’s an app for that” used to be a funny tag line, now it’s truth. Digital literacy and digital skills are only part of the equation for a successful digital transformation. Students can’t be digitally literate without having some digital skills and the greater their repertoire of digital skills, the more digitally literate they are. But having skills and being literate, digitally or otherwise, isn’t the same as using those skills and abilities to transform how students learn and express their learning. Students need to be taught how to use their skills to express their learning. understand how to organize storage, whether it’s on a hard drive or part of a server farm (that has no resemblance to an actual farm) thousands of miles away. Because so many just get a new phone or delete old stuff when they run out of memory on their smartphones, they don’t understand the limitations of memory, of storage, or even the correlation between the memory on those smartphones and cloud storage. Understanding these fundamental elements of computing as they relate to digital skills and digital literacy is no small thing. 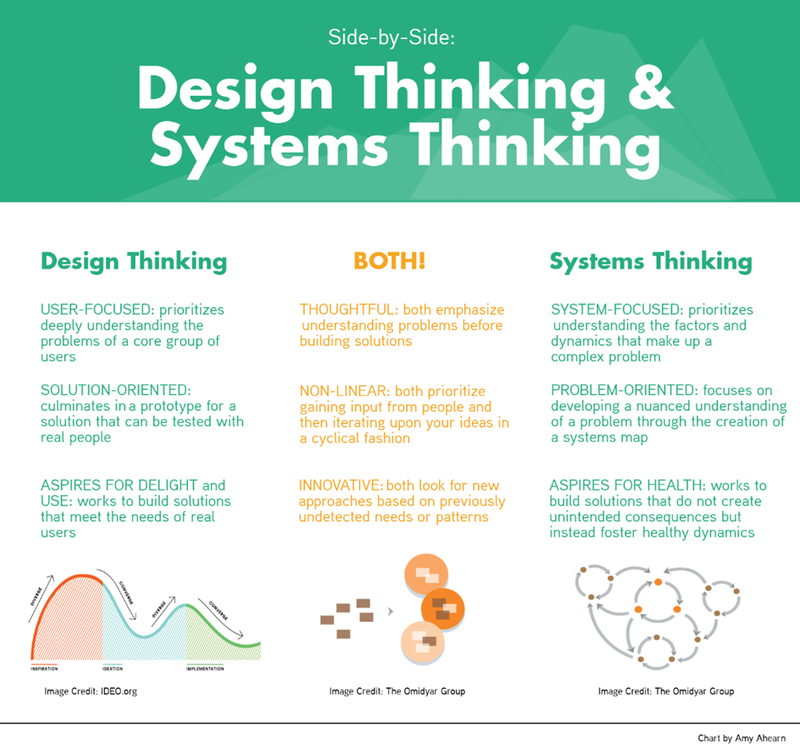 In the work place, managers talk about systems thinking, design thinking, and computational thinking, each of which is a way of thinking about processes. There are intersections between each of these models and elements of each of these are often seen in classrooms. When a teacher teaches a student how to break down a problem, task, or reading passage into smaller manageable chunks and focus on working through that part first, the teacher is introducing her students to components of computational thinking. When a teacher helps a student go through the process of creating an outline to organize his thoughts before writing a paper or working on a project, that student is learning elements of systems thinking and design thinking. Teachers help students develop schemas for their learning. Imagine if students (and teachers) knew that grown-ups working on large and small projects around the world were using similar strategies to do their work, too. And imagine if students understood the nature of systems thinking, design thinking, and computational thinking, and were able to learn how to choose the best tools--sometimes pencil or crayons and paper, sometimes something digital--to complete the task. That’s digital transformation. So how do you drive towards digital transformation in your school? Well, I could spend some time talking about Knoster's Change Model. Have a plan, have a plan, have a plan. But I know that's too broad for a lot of people because they know it's something they need to do but don't quite know how and where to start. Let's assume the vision is to have complete digital transformation in the building by the end of 2019-2020. (Sheesh. I can't believe I just wrote that AND that 2020 is only two years away?!?!) That's a good start. The next step is to establish some goals to make that happen. Let me help you get started with that. The following goals make not make sense for your school, but perhaps the list will give you some ideas of how and where to start, or how and where to continue. Teachers are having conversations about blended learning practices in their classrooms (#dowhatmakessense) and at the grade levels, reflecting on the ways digitally-based and digitally-enhanced learning supports, stretches, and builds student engagement and learning. Teachers are using stations (content and tasks/activities change) and/or centers (content focus is static--writing center, reading center, math center--while tasks/activities change) as ways to integrate digital transformation. In their grade-level meetings, teachers are sharing ideas and practices for integration digital tools and resources, thinking first in terms of student learning, then about pedagogical practices, and then about appropriate technology. From the beginning of the school year, <school name> teachers are finding ways to integrate technology regardless of content area and, as appropriate, in ways that complement their grade-level colleagues. By the end of the school year, the majority of <school name> teachers are able to implement digitally-based or digitally-enhanced activities and lessons reflectively and reflexively. Throughout the school year, students will be given opportunities to develop the skills and habits of mind to fail forward--to learn from their mistakes and recycle that learning. Throughout the school year, students will become more comfortable taking calculated risks in the process of their exploration, questioning, and other opportunities to learn. Throughout the school year, students will be given opportunities to develop an interest in “figuring it out” rather than simply looking for the right answer. A next logical question is this: how do we know if we're meeting those goals? Great question. Hold on, an answer is coming. But first. . .
What happens when you cross blended learning with digital transformation? You may get STEAM! STEAM enables students to make connections in their learning across disciplines. It can remove limitations and provide opportunities for wonder, inquiry, and innovation. Collaboration and hands-on, process-based learning through exploring, observing and doing are at the heart of STEAM teaching and learning; it may include technology, or not. STEAM is intended to be an integrated approach to learning that requires an intentional connection between standards, assessments, and lesson design and implementation. True STEAM experiences involve multiple, even overlapping standards from Science, Technology, Engineering, Math, and/or the Arts to be taught and assessed with or through each other. This is the essence of transdisciplinary learning. This is very important because we can no longer think that STEAM is only about science; science is only one component of STEAM and not always the most important. 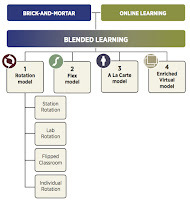 The Christensen Institute is the best-known organization that talks about blended learning. From their perspective, students learn in a traditional classroom environment in a variety of ways and learn via technology in a more personalized, even adaptive approach. For the Christensen Institute, the key is that students are learning via technology at their own pace in a way that best suits what they need and want to learn. 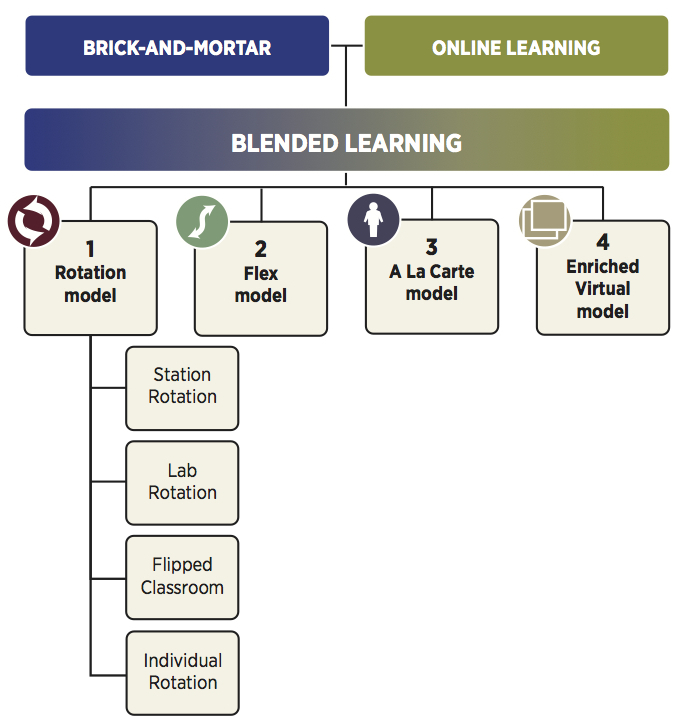 This is one way of thinking about blended learning. Note that the first version of the Rotation Model is Station Rotation. That’s key because it works best for most teachers in most schools and, to be honest, helps teachers feel like they have more control over student work, especially as teachers try to monitor student learning and progress. Keep in mind that a center is considered to be more static. That is I may create a reading center and a writing center in my classroom that is there from the first day of school to the last day of school. What changes depends on the students but students know they go to the writing center specifically for writing tasks and activities. They also know they go to the writing center, for example, at particular times and that who goes to the writing center depends on what which students need when. What students need could be remediation, could be practice, or could be more challenge. Stations are something in which all students participate on a given day. For example, let’s say students are working on fractions and it’s time to review a variety of concepts. At one station, students could be working on a hands-on “art” project to show decomposition of fractions. At another station, students could be using BeeBot to determine the most efficient path to find equivalent fractions. At another station, students could be using Legos, dominoes, pattern blocks, and/or Cuisenaire rods to complete some fractions tasks. At another station, students could be using Scratch, Powtoons, paper slides, Screencastify (Chromebook extension/app), green screen, Padlet, or other possibilities to create an explanation of something about fractions. Teachers wouldn’t necessarily use the same tools in stations every day because they would be thinking first of student learning needs, then about pedagogical/learning practices, and then choosing the technology that makes the most sense to support that student learning. As you look at those examples for stations, there is a variety of technological/digital options. In fact, students could be offered choice in some stations, though that can be harder to manage. What you might also note is that because students are having to 1) think critically, 2) communicate as they 3) collaborate, and are often being given the opportunity to work 4) creatively, they are practicing the 4Cs that are critical elements of STEAM. In the math stations listed above, students are using technology, math, engineering (problem solving), and some art as they work through the stations. What can be the guidelines for STEAM in our classrooms? What are the defining characteristics? Features multiple standards across content areas; this might be one standard from ELA and one from math or science or social studies. Engages students in exploring, creating, questioning, observing, and doing. Builds and supports a growth mindset and failing forward. Encourages feedforward learning and perspective from administrators, teachers, and students. Involves students working collaboratively and cooperatively. Reflects a risk-free atmosphere for students to learn from mistakes and keep trying. One of the big differences in STEAM is that learning is often transdisciplinary. So how do you know if classrooms are being transformed digitally? Schools and districts are not really that far removed from businesses in this respect, so let's co-opt their six changes and make them our own. Even if we're not comfortable doing that, we know we cannot be satisfied with "business as usual." Seriously, then, how do we know if digital transformation is occurring or has occurred in our classrooms? Will students be able to be engaged in collaboratively and/or cooperative problem-solving? Will students be able to experience digital and non-digital tools and resources in their learning? In what ways will they be given time and resource/tool choice to explore, create, question, observe, and/or do something as part of the scope of their learning experience? Will students have the option to use digital and/or non-digital tools to complete a task? As appropriate, will students have the option to consider multiple approaches to the problem solution? When appropriate and in pursuing any one of those approaches, will they feel comfortable taking a risk and learning from a possible failure? As appropriate, will students have the opportunity to research possible solutions or other information they might need for the task? Do they have the learning tools/skills to learn from failure and recycle that learning to figure out how to be successful? Are students given the opportunity and time to “figure it out”? Are students able to make authentic, relevant, and/or real-world connections with their learning? In what ways are they being opportunities to practice and develop their 4Cs skills? To be creative and collaborative? To practice communication skills with each other and the teacher? To engage in critical thinking? As appropriate, is the role of the teacher mostly about coaching and facilitating learning? Asking clarifying and probing questions to encourage students to think more critically and creatively? To help students make authentic, relevant, and real-world connections with their learning? Is the role of the teacher mostly about helping students make the best choices for the tools they might use to approach their tasks or problems rather than making the choice, whether low-tech or high-tech? Is the teacher able to coach students to make transdisciplinary connections? Has the teacher made clear what success looks like or sounds like? Is the teacher able to coach students to practice and develop their 4Cs skills? 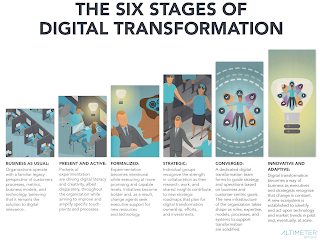 Make sure teachers understand that digital transformation takes time and looks different at each grade and even in each classroom at the same grade level. This will alleviate some of the pressure everyone will feel. 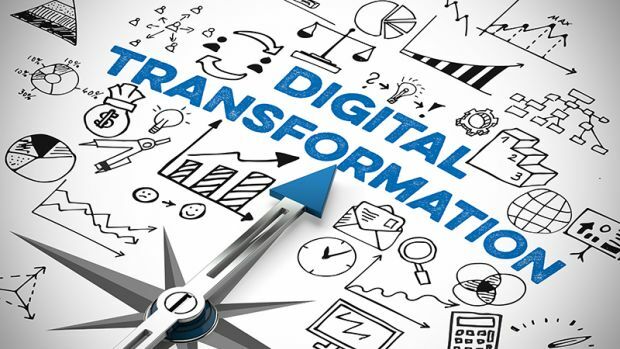 Have the technology coach, instructional coach, or curriculum director work with grade-level teams to determine reasonable and measurable expectations for digital transformation and transformational learning at each grade level for each quarter. This may be as simple as identifying one digital tool they will use and for which they will try to develop mastery. Or, take a jigsaw approach, and provide some grade-level choices for each grade-level team and have each teacher on the team select one tool to use and then be responsible for sharing with the rest of the team. Regardless of the approach, plan to review these expectations at the end of each quarter to determine what was met and what needs to be revised. Determine how transdisciplinary learning supports the culture of the school and work of the teachers and students. I would do this in the 2nd quarter of implementation so that teachers will have some level of buy-in and understanding. Then the teachers can speak to the ways transdisciplinary learning supports student learning and school culture. 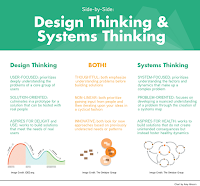 If appropriate, ensure teachers are familiar with various systems and processes of thinking and doing (engineering design process, scientific method, systems thinking, design thinking) and can assist students in making use of an appropriate system or process of thinking and doing. MAKE A PLAN TO HELP TEACHERS SHARE THEIR LEARNING, GROWTH, AND EXPERIENCES! You may have to crowdsource this as well because what works at one building may not be as effective at another. 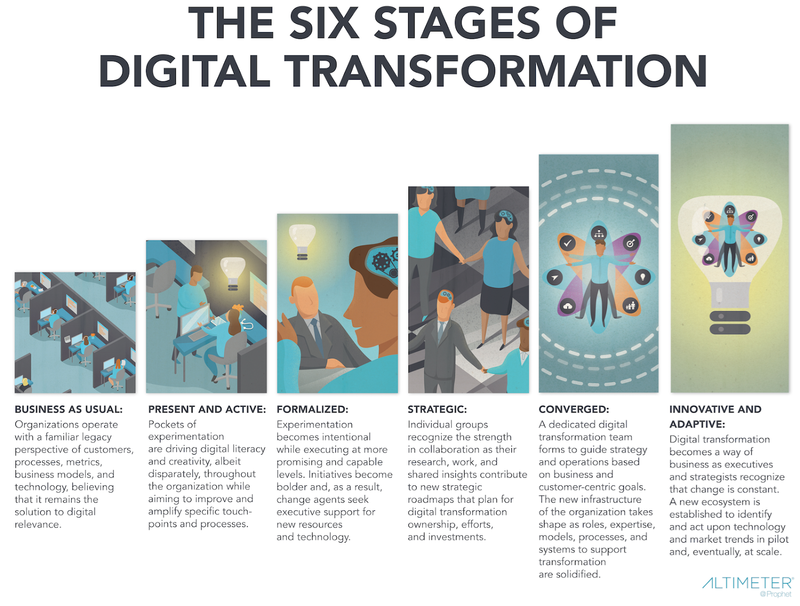 Digital transformation is not a pretty eduspeak term. It's the real deal. If you haven't gotten started or if you're not where you need or want to be, all is not yet lost. But get started now. And I mean now. A couple of weeks ago I wrote about coaching and how a good instructional coach can make a difference for teachers and administrators. It's entirely possible you agree with that but aren't too sure what to do next or that you've had an experience with an instructional coach that wasn't all that positive but your gut tells you to rethink this proposition. Whatever brings you here. let's talk about instructional coaching. 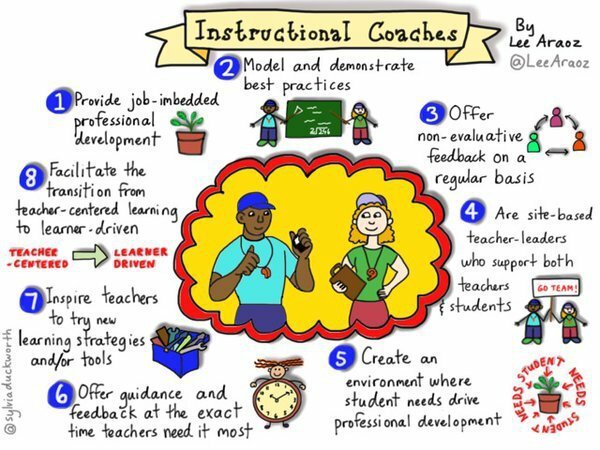 You'd think most folks would understand instructional coaching--what it is and what a good instructional coach can accomplish. Experience tells me that's not the case. The wonderful image to the left explains a lot of what instructional coaching is all about and one of the most important elements is non-evaluative feedback. One hopes it's on a regular basis, but that can be a challenge. But let me back up a bit. In 2015, the incomparable Jennifer Gonzalez wrote about being an instructional coach. As she points out, there are reading coaches, math coaches, literacy coaches, and technology coaches. Then there are those of us who are generalists who can and do work with classroom teachers across grade ranges and content areas. My work is about pedagogy and, where it makes sense, an effective integration of technology. Gonzalez interviewed others to get their perspectives on coaching and reports what Elena Aguilar told us in The Art of Coaching: work on the relationship AND listen more than you speak. I know the teachers with whom I work have expertise and experience. I cannot underestimate that. My job isn't to tell them how to teach; my job is to help them gain perspective on themselves and their students so they can maximize their skills and abilities in the classroom. My job is to help teachers figure out ways to help their students use their natural curiosity to learn how to learn. Heather Wolpert-Gawron found herself making the transition from classroom teacher to instructional coach, and once that role became a full-time one, she notes she was able to mold the position to meet the needs of her site and her teachers. It's no surprise that the first function she lists is that of mentor. Again, listen more than you speak as you build that relationship. I find the teachers with whom I work often need me to help them filter the thousand-and-one things flying through their heads, and to help them brainstorm and to focus on ideas that they can make work. Unlike Ms. Wolpert-Gawron, I'm not permanently located in a district so my teachers see me once or twice a month. And though I'm available electronically, we make much more use of our face-to-face time. One of the other roles listed by Ms. Wolpert-Gawron is that of professional development coordinator. When an instructional coach is really listening to a teacher, the coach can calibrate the professional development to meet the needs of a group of teachers or as many teachers as possible. Though we know one-size-fits-all is not ideal, our only option is often meeting with all faculty. So one of the things we need to be able to do is speak generally but engage specifically. In a word, differentiate. What else do instructional coaches do? Again, Ms. Wolpert-Gawron is spot on: research, curate, and publicize. Most of the districts with which I work have created an email account for me so we can create an internal Google Classroom so I can share resources with teachers. And I can model how to organize and use Google Classroom at the same time! I use Edmodo for another district because that's what we started with three years ago. I very deliberately called my company p20partners. My original goal was to work with teachers PreK through university level. I've been privileged to work with educators at the PreK through 12 levels, but still trying to break through that resistance at the university level. That's actually irrelevant because the most important part of my company name is "partners." I can't and won't tell a teacher how to do his or her job. I don't know their kids as well as they do and a few observations here or there doesn't give me deep insight into how they teach. HOWEVER, what I do know is that the teachers and administrators with whom I get to work count on me to help them think through their challenges, to come up with tools and resources to help them maximize their time with their students, to be available when they have questions or want to share out ideas via email or text, and to support them through their learning curves without judgment. And when they let me show their kids some new tools and resources to help students and teachers get a sense of the value of that tool or resource, that's just extra chocolate syrup on top for me. Not too long ago I did a PD session with a group of teachers and we talked for quite a while about the 6 Qs: IQ, EQ, PQ, CQ, CRQ, and IMQ. The 6 Qs have a logical place in the corporate space, but it was clear that the teachers were quite thoughtful about the implications of these Qs not only for them, but for their students. They were particularly interested in the passion quotient and the courage quotient because they struggle with kids who aren't willing to persevere and they wondered if it's because they don't have the courage to fail. Teachers talked much longer than I expected; it was rich and so insightful for me. In fact, that conversation went so well, I'm planning to introduce some administrators to the concepts to see what they think and how the 6 Qs might influence how they interact with their teacher leaders. I think a key role of an instructional coach is learner. 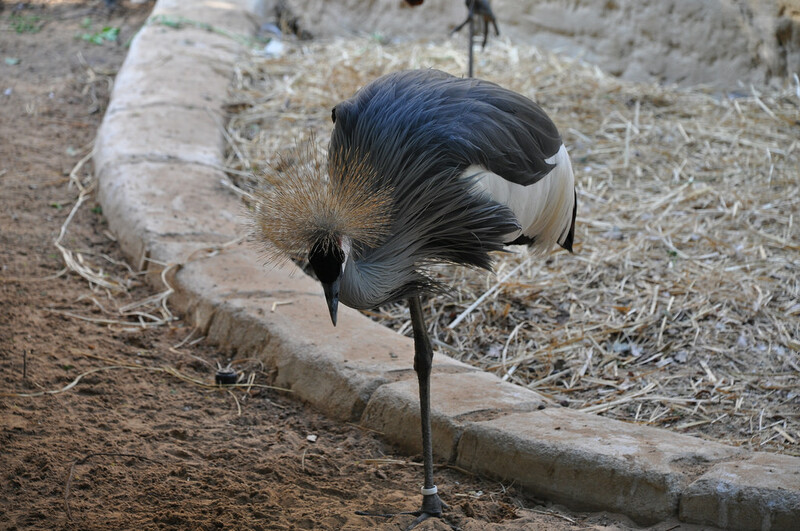 When I have a teacher ask me about something and I get to scurry around the internet looking for resources or crowdsourcing colleagues to see what they know or have used. And then I get to play to figure out what might be best for that teacher and those students. But then I get to share that learning with others who may not even know that's a question they wanted to ask. Whenever I learn something new, I get to think about "my" teachers and who might find what the most useful. I share with everyone, but I might send a separate note to a specific teacher because I want them to remember that even though I'm not always with them, I'm usually thinking about them and I want their very best for their students. I always tell my teachers that our time together is not my time, but theirs: it's for their learning and growth, it's for their support and encouragement, it's for them to let me partner with them to help find some solutions or help them think through tools and resources that will meet a learning objective or help their students stretch. Peg Grafwallner, writing for Edutopia, underscored how often the instructional coach provides that opportunity for processing. Just recently I was reminded of the one-legged interview, one of those strategies I'd forgotten--which reminded me of the conversations I often have with teachers who have forgotten effective strategies they used to use because their immediacy was crowded with all the new stuff. So the one-legged interview is called that because the conversations should last as long as you can stand on one leg. The questions are designed to invite teachers to process or to reflect. Non-judgmental; non-evaluative. A short conversation that may remind me of something or spark something for the teacher or lead to a longer conversation that invites more processing and reflection, more opportunities for me to rummage around the internet and find cool stuff. 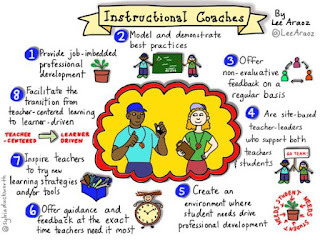 So when you're thinking about hiring an instructional coach, either full-time or as a consultant, keep these roles in mind: mentor, listener, encourager, researcher, curator, disseminator, PD coordinator/collaborator, partner, and learner. Your teachers will thank you.